A painting by a chimp was passed off as modern art by a French artist. Has a modern art painting fascinated you ever? 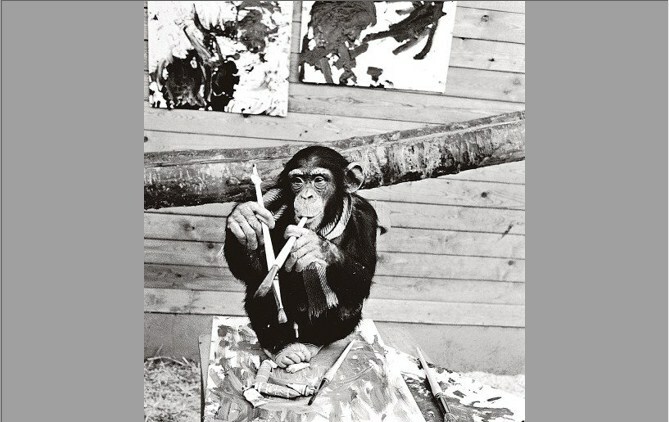 A painting made by a chimp once fascinated a French Artist so much that he actually passed it as a modern art painting. Pierre Brassau was a star and not an ordinary chimpanzee. In the year 1964, the Swedish tabloid Goteborgs-Tidningen had a journalist named Ake ‘Dacke’ Axelsson, who came up with the thought of having the non-human individuals create a series of paintings for him. He created a hoax saying that the works were of an unknown French artist named Pierre Brassau. He wanted to find out if the critics could spot the difference between avant-garde modern art paintings and the paintings made by a chimpanzee. Pierre Brassau was none other than a four years old chimpanzee in Boras djurpark Zoo. No doubt modern art fascinated Axelsson, he wanted to find out whether the critics could understand the difference in paintings made by humans and paintings made by animals. He insisted Pierre’s 17 years old keeper to give a brush and a few paints to the chimpanzee to find out what he could do with them. The moment Pierre created various paintings, Axelsson chose four from the lot and then exhibited them at Gallerie Christinae, Goteborg, Sweden. The critics were so enthralled by the paintings that they appreciated the fabulous strokes and determination portrayed in the paintings of the painter. After receiving several praises and appreciation from the critics, the hoax was revealed. Yet, the critics insisted that Pierre’s work deserved all the attention that it received and was surely the best painting in the exhibition. In fact, a collector bought one of his works for $90USD.